It is the fourth day of winter, by the strange conventions that we non-Indigenous Australians continue to carry as so many imprinted Northerners. I am sitting in a t-shirt hastily bought at the West End markets. A light breeze is working up from the south east, I cannot see a cloud and the air temperature is 23.3 degrees. I've been transported to Brisbane for a conference and have gone from Canberra experimenting with a winter of -7 degrees, a sun that doesn't rise til after 7, and the view from my kitchen window filled with the skeletal hope of deciduous trees. There is something miraculous about a day that orders you to strip off jumpers, coats, a day that cannot even imagine bone numbing cold. So a day to wander, note, poke about. My principal reason for staying over into today was to see the Lloyd Rees drawing exhib at the Qld Art Gallery. So I've just had the enormous pleasure of pouring over what is actually a small show of largely early drawings which he drew as a young man finding his way of seeing. Conservative certainly, they have an Edwardian aesthetic combined with that easy skill of perspective righteousness, but Rees managed even in those earliest of drawings to do something with an sure deftness - to draw light. I'm not a huge fan of his paintings, but his architectural drawings, yes. What paper did he use? Did he scumble his shadows or draw them in? Did he rub off shading to pull the light through? How fine a point did he use to define the edge where a form turns and breaks into shadow? The drawing at the top of the post isn't in the show - its from the decade after he had left Brisbane and taken his first trip to Europe, but his drawing style still has that tone of sheer joy at what a pencil mark on a page can make. A lot of architectural drawing is flat on the page, static, numbingly tedious in its fussy detail, vague in its technique and sense of place. Rees is rarely pedestrian; there is always a nugget of joy at the play of light and shadow in the most flippant of his sketches. There's a small drawing about 120mm high of a statue of a matriarchal Queen Victoria - sceptre in hand, double chin and matronly cap. I don't know the statue - presumably it's still here somewhere in Brisbane, marooned on a street corner by 8 lanes of traffic, but I'd imagine it's like hundreds of cast Victorias scattered throughout the cities and towns of a grateful Empire - heavy folds and weighted cast Queens on stone plinths. Dull, dulled, light absorbing, an object you would walk past without regard to its changing form as the light moves across and around it. But Rees had drawn this Queen drenched in Australian light - an exquisite exercise in the play of light, defined by lines and nuanced pressure of the pencil on the paper. Perhaps in a city of low rise buildings as Brisbane of the second decade of the twentieth century would have been, a small grey woman looking for all the world like Toad's washerwoman cast in bronze, would have sat bleaching in the sun but it surprises me to see her rendered drenched in light instead of glowering from the gloomy shadows in our CBDs. 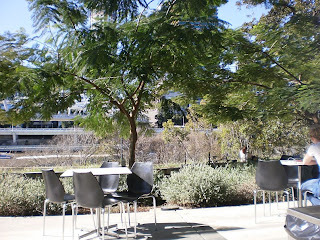 From the snaps above, you might work out I'm now sitting at the cafe at GOMA. Brisbane friends were certain I'd enjoy it. The building yes but I'm a bit bewildered by a gallery that seemed largely empty. I'm still not quite sure if I somehow missed the major galleries by taking the wrong staircase or exit. I have a sneaking suspicion it's a building in need of a collection. Though you have to admire the chutzpah of building the field of dreams, assuming they will come. Given the behaviour of the Brisbane River earlier in the year, I'm not quite so sure that placing all of your major collections beside such an unruly body of water is such a good idea. But I will say that the damage to this part of the river environs is not obvious to a tourist or anywhere else I've been around Brisbane over the last couple of days - where did all the mud go to? 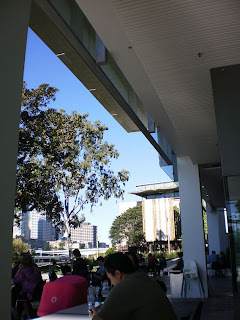 I find Brisbane quite geographically confusing as its modern form seems to play scant attention to its river setting with freeways running along river banks and tall buildings walling the city into a play of sections and quarters. Developers are eyeing off West End with 30 storey apartment blocks in the offing for an area inner Melbourne-like in its scale but Brisbane in its casual opening to the street. And yet again this will be to the east and north of West End's high street, with more shadows engulfing our communal spaces. What planners think they are doing when they approve such sitings beggars belief - Dickson shopping precinct in Canberra has just had its new master plan released which has a fine collection of ominous grey shaded blocks marked "6 storey development" along the northern side of the precinct. Presumably they have not ventured out of their over heated offices during a Canberra winter into a windswept over-shadowed public space. As the afternoon pulls into its lateness, the light is flattening, dropping to glare off the horizon. It will be late when I get back to Canberra. Late and cold. Late, cold and dark. A winter city in a southern clime. That's quite a contrast between your two lives. I'm a country man but do like to visit the city now and then. 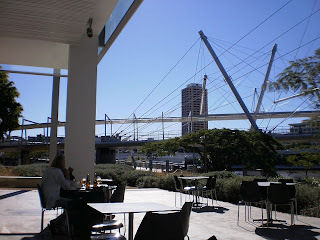 Brisbane sounds like a vibrant city!